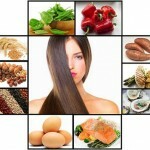 As of 2012, the USDA recommends eating a variety of protein foods for maximum nutrient intake. Nuts are considered a protein food and have many health benefits. Nuts have been shown to reduce the risk of cardiovascular disease and certain cancers in clinical studies. Also, due to their high fiber, high fat and protein content, nuts have been shown to help with overeating by increasing satiety, which can help with lowering body weight. Women are at a higher risk for cardiovascular disease than men and eating nuts as part of a healthy diet can help reduce that risk, especially for women who have Type II diabetes. All nuts are considered a healthy protein, but each nut can have unique health benefits. Knowing what these health benefits are is a good way to determine the right nuts to consume. Making the choice to eat nuts every day is a good choice no matter what nut you choose to eat. Nuts are full of mono- and poly-unsaturated fatty acids (the good fat), protein and fiber. Replacing another protein with nuts helps balance the diet and increase micro nutrient intake, such as B vitamins. However, since nuts are high in calories and come salted often, it is important to understand serving size and nutritional information. 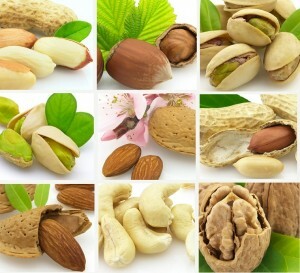 · Subtract the amount of protein consumed in the nuts from daily protein needed. The average adult female needs approximately 46g of protein per day. 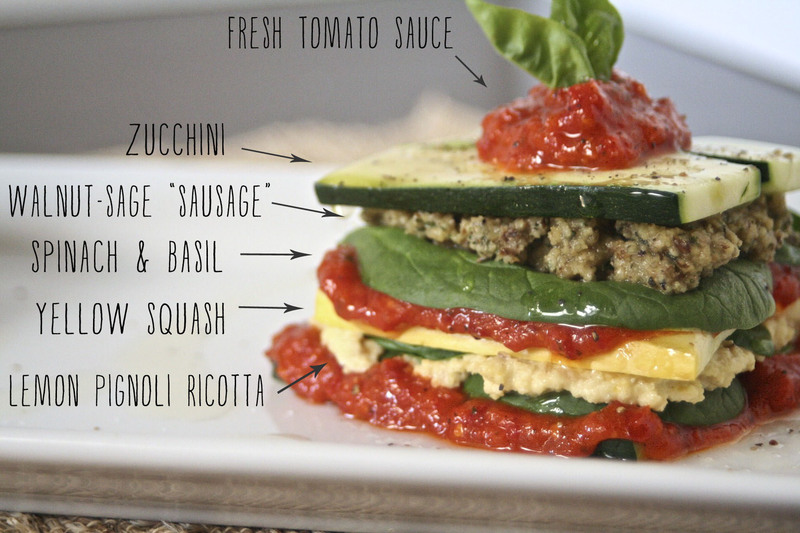 · Subtract the amount of calories and fat from total consumption for the day. The average adult female needs approximately 2,000 calories a day and 20% to 35% should come from fat calories, limiting saturated to less than 10% of total calories. · Try to consume 1.5 oz. of nuts daily. According to scientific evidence, 1.5 oz. 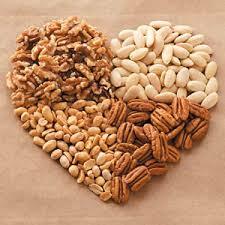 is the optimal amount of nuts for heart health, especially in women with Type II Diabetes. Many pre-packaged nuts are roasted and salted or seasoned. These seasonings often contain msg or salt and can add a considerable amount of sodium to your diet. To avoid excess sodium, go for nuts without salt or seasoning. If you need the salt or seasoning for flavor, try and buy the nuts lowest in sodium. Excess sodium can lead to water retention and may increase the risk for hypertension. Nuts make great snacks because they do not need refrigeration and can be eaten quickly. Also, they are filling and help keep unhealthy snacking between meals to a minimum. The extra protein provides a longer lasting source of energy than a simple carbohydrate would. If you are having trouble getting enough nuts into your diet or don’t like the flavor of them plain, try adding them to meals. Cashews and peanuts go well in a stir fry or chili. They cook like a raw whole bean, so the longer they are cooked the softer their texture becomes. Different nuts can serve specific purposes based on research and nutritional content. If you want to decrease your risk for breast cancer you may choose a nut that has been shown to do just that. You could also buy a mix of nuts or create your own based on dietary objectives. Choose walnuts for the best overall health effects. Walnuts are extremely healthy nuts having multiple benefits for consumption. They have almost as much omega 3 fatty acids as salmon has and more than is recommended for a daily serving of linoleic acid and alpha linoleic acid (omega 3 fatty acids). These fatty acids have been shown to increase brain function, protect against Type II Diabetes and decrease risk of cardiovascular disease. In addition to omega 3 fatty acids, walnuts contain high amounts ellagic acid, which promotes immune health, and vitamin B6. 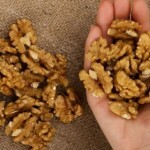 In clinical research, walnuts slowed the development of breast cancer in mice. Choose peanuts if high protein and heart health is important to you. Peanuts, although technically not a nut, but a legume, have the highest amount of protein at 7 g per oz. 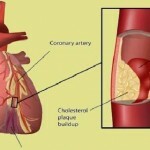 They have also been shown to keep cholesterol levels low and protect against cardiovascular disease. A unique nutrient in peanuts is resveratrol, the antioxidant found in red wine with anti-aging properties. Choose pistachios if satiety is important. Pistachios are high in protein at 6 g per oz. and the highest fiber-containing nut. The amount of fiber in pistachios is equivalent to the fiber found in oatmeal. These have also been shown to protect against cardiovascular disease. They contain high amounts of plant sterols that lower LDL cholesterol levels. 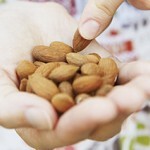 Choose almonds for the best cancer protection. Almonds are the most nutrient dense nuts and contain very high levels of vitamin E and vitamin E boosting compounds. Vitamin E has been shown to protect against stroke and cancer, including breast and colon cancer. Choose Brazil nuts for the best breast cancer protection. Brazil nuts are high in selenium. Selenium has been shown to lower the risk of breast cancer. Choose macadamias, pecans and cashews nuts for heart health. All are high in monounsaturated fatty acids. Pecans have the highest amount of unsaturated fatty acids and the lowest amount of saturated fatty acids compared to other nuts. Cashews also offer high iron. Choose hazelnuts if you are pregnant or of child bearing age. Hazelnuts are high in foliate, which protects against birth defects. They also are high in vitamin E and B vitamins and evidence suggests they may help delay dementia. 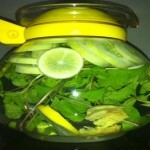 They also reduce the risk of cardiovascular disease by lowering blood pressure. Choose a mix if you want the health benefits of many nuts and the convenience of having it ready to go. In the supermarket you will be able to find nut mixes made for heart health, energy or just flavor. Here are many options when it comes to purchasing nuts. They come in small packs, bulk packs, mixed packs and more. Nuts spoil quickly and purchasing the right amount and storing properly is key to maintaining optimal freshness and health benefits. 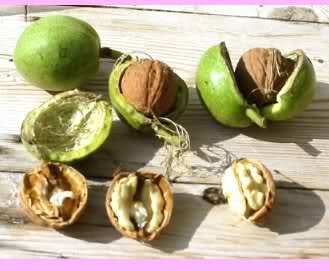 Understand the different forms nuts come in. Nuts can come whole, with or without shell or in pieces. They can also come roasted, with or without flavors and/or with salt added. By knowing the forms and checking the nutrition labels, you should be able to choose the best for you. Whole nuts are good for snacking on plain. They tend to stay fresh longer as well. Nuts without the shell are more convenient for eating on the go. Pieces are usually better for cooking. The smaller pieces help reduce cooking time and save you the trouble of having to remove the shell. Roasted nuts are roasted to bring out natural flavors and come without the shell. Roasted nuts generally contain salt and seasoning, so check the label for sodium content. Know the types of packaging and what will work best for you! Purchase nuts in bulk if you plan on eating them every day, plan on sharing them or cooking with them. This is the most cost effective option. They should be stored in a sealed container and in a cool dark place for the longest shelf life. Usually, nuts only last about three weeks when stored properly. Purchase nuts packaged, such as in a canister if you plan on consuming them within three weeks and are not sharing. These are packed for freshness and in a small enough amount that you will be able to consume them all before they go rancid. Purchase portion controlled packs if you are worried about over eating. Portion controlled packs are good for ensuring you only eat what you need. They also stay fresh for longer amounts of time because each pack is opened and consumed in entirety. Creamy Brazil nuts are packed with selenium, a mineral that may protect against prostate cancer and other diseases. Just one nut contains more than a day’s worth, so eat these sparingly: Recent research has hinted that too much selenium may be linked to type 2 diabetes risk. One ounce of Brazil nuts (6 nuts) contains about 190 calories, 19 grams fat, and 4 grams protein. With their high fat content, nuts turn rancid quickly unless stored tightly sealed in a cool, dark place. So buy ’em like you eat ’em (in small amounts), says Jennifer Nelson, director of clinical nutrition at the Mayo Clinic. 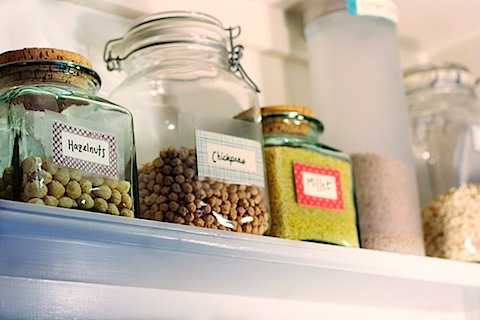 Proper storage will let you enjoy them for at least 3 weeks. Grab a can of one of our favorites, the Planter’s NUT-rition Men’s Health Recommended mix. It rocks three of the healthy superstars in the list above—almonds, pistachios, and peanuts. Whole nuts with the shell on tend to keep longer than nuts without the shell. If you plan on keeping them in a bowl or storing them for longer amounts of time, whole nuts with the shell on are the best option. Be careful with nuts if you think you have any tree nut or peanut allergy. It is best to discuss with a doctor before consuming nuts if this is the case because reactions can be very severe. Look for our delicious recipes for breakfast, lunch, dinner and a healthy delicious snack for you and your family.